Colonel Owen Cousins is head and shoulders above the others: its enormous white buds are as big as tennis balls. 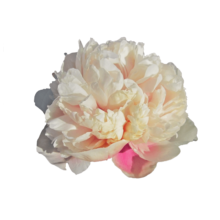 An exclusive flower who's not only loved because of its size: its copper glow gets noticed by many growers and peony fans. Colonel Owen Cousins offers us white flowers with a salmon pink glow and the desired bomb shape. This peony stands out because of her immense flower buds. The American Peony Society even classifies her as four-way crossed flower! This flower is perfected down to the last detail: you are looking at a peony masterpiece. This flower is a tribute to the loved son of Lyman Cousins. Lyman Cousins and Klehm registered her in 1972. However, Colonel Owen Cousins has been grown just recently by our growers. For this reason this peony is an exclusive one. The peony has a white bud with a copper glow. This causes the rusty color of the peony. When the bud opens up, the glow shifts to the center. Almost like a magical spectacle that sets off slowly, but steady. It makes the flower special: you can see the color change in front of your very eyes. Since 2018 Colonel Owen Cousins has been grown by two of our growers. For now, she will be exclusive. Interested in this extraordinary peony? Stay up-to-date!